Officials in Los Angeles broke ground late last week on the second leg of a long-planned 9.1-mile extension of the city’s Purple Line subway. The so-called Section 2 extension will bring an additional 2.59 miles of underground track and two new stations to the line in addition to the 3.92 miles currently under construction for Section 1 of the extension, The Source reports. The Los Angeles County Metropolitan Transportation Authority (Metro) began construction on the Section 1 extension in 2015 and is currently 30 percent done with work on that leg. Work on Section 1 is expected to be completed by 2023, with Section 2 wrapping up in 2025, and a planned Section 3 completed the following year. Metro is aiming to finish the entire 9.2-mile extension before the year 2028, when Los Angeles is due to host the Summer Olympics. Section 1 of the extension will thread the heavy rail line to the intersection of Wilshire Boulevard and La Cienega, just west of the Los Angeles County Museum of Art campus. 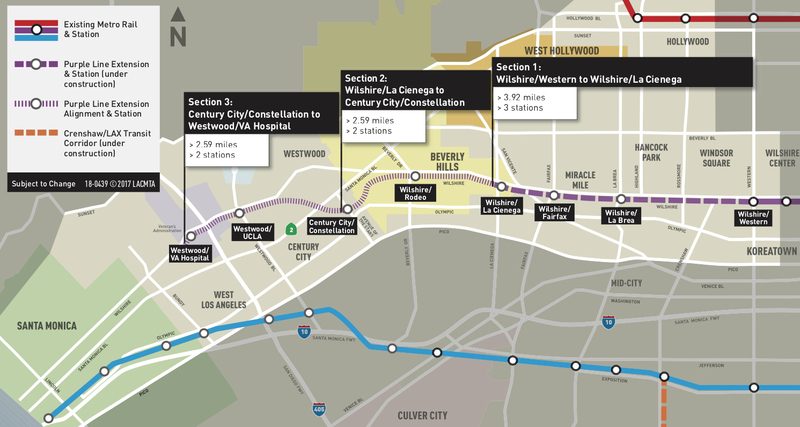 Sections 2 and 3 will bring the line to Century City and the Veterans Administration campus in Westwood, respectively. Metro recently awarded a $1.37-billion construction contract to joint venture contractor Tutor Perini O&G to build the Section 2 subway; Another joint venture contractor—Skanska-Traylor-Shea—is building Section 1. Work on the line has already begun to impact the areas around the extension, with many new high-rise projects currently in the pipeline for sites immediately surrounding Wilshire Boulevard. The expansion has also spurred new construction of luxury-oriented housing adjacent to existing stops, as well. During a public presentation earlier this month, Metro officials detailed construction activity for the extensions, providing an update on utility relocation work, detailing which street tree specimens would need to be removed—and replaced—to facilitate construction, and also debuted preliminary renderings for the above-ground elements of several new transit stations. 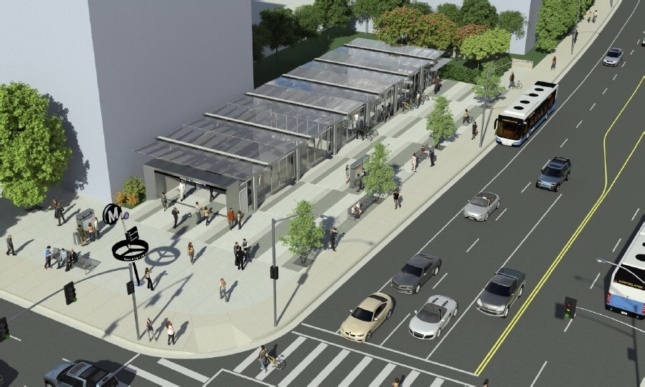 Renderings for these new stations depict glass canopy-topped subway entrances surrounded by hardscaped plaza spaces. 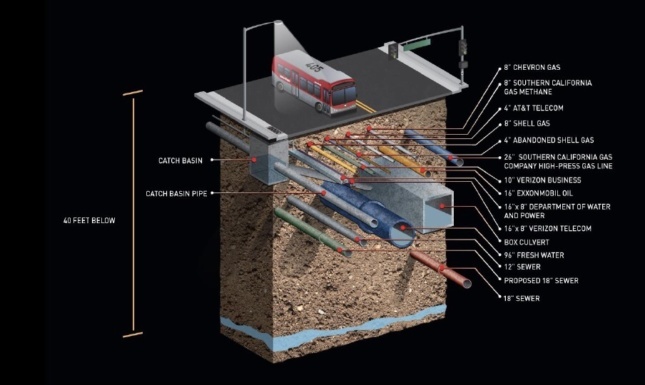 Next, Tutor Perini O&G and several utility companies will work on reorganizing the maze of pipes and conduit below city streets for Section 2 areas, while work on a staging site that will be used to begin drilling the subway tunnel takes place. Work on the Section 1 extension will continue as planned.